I'm new to bentos, but these look great. Is there a way to keep the items cool? Is there somewhere to stick an icepack type thing? I am LOVING these bento boxes. Please keep sharing them! You've inspired me to start looking at other sites with info on bentos. In the next week I plan to start gathering supplies and then I will spend the summer experimenting with Bentos so I'll be all ready for school lunch in the fall. Since Sugar started elementary school, lunch has been a major issue for us. I think Bentos might be the answer!! I just throw them into a small insulated bag with a mini freezer pack. That seems to do the job. This time of year, you can find these bags all over the place, Target has a ton, so does Jo-Ann fabrics in their "outdoors" area. Now theirs get heated back up at school, but also easy enough to pack "cold food" for regular school lunches. Thanks a bunch. My little gut is only a year old, but we have friends w/kids who are school-aged. I think they would really enjoy bentos! Fat Lady, welcome to the obsession! There area bazillion Flickr groups on Bento and quite a few blogs too. I used to post to Bento Yum, but simply not finding time to be as active there as I'd like...so throwing them up over here. 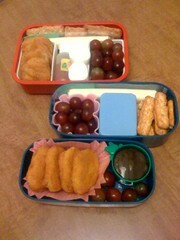 I make bentos twice a week for the kids and a few times a week for Greg. Also love taking them when we're doing something like the Zoo. What is so special about these? They're tupperware containers. I don't understand the fascination. Actually, bentos are not tupperware containers. They're adorable specialized lunch boxes designed to hold maximum food in minimum space. Really though, you can use tupperware for bentos. Bentos are about the idea of "small bites" and variety. Basically, you're packing a lunch that has a variety of foods in a small space while being filling and healthy. I just use them as a way to make lunch a little more fun for my picky toddlers. Sorry.....but I had heard to never give grapes to a child under two as they are a choking hazard. I googled and found the FDA site says not to give until after age four (http://www.fda.gov/fdac/features/2005/505_choking.html). I'd never suggest you give grapes to your children if you aren't comfortable with the idea of doing so. I firmly believe each parent needs to make their own choices about what risks they're willing to take or not take with their kids.